Every fighter knows the name. Anyone who has followed the growth of MMA and the origins of the UFC has heard the stories. Though he would never describe himself as “The Legendary Jeremy Horn”, he simply prefers Jeremy. His lengthy list of accomplishments tells another story. Starting in the world of Martial Arts at the age of 12, Horn now has over 160 professional MMA fights. 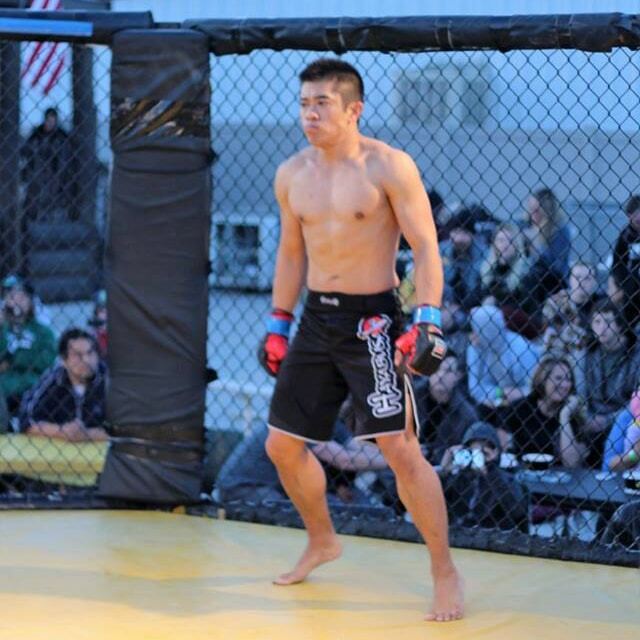 He has competed in nearly every organization in the world, including: UFC, Pride, IFC, IFL, Rings, and King of the Cage. 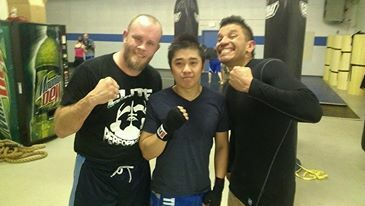 Jeremy still competes in an occasional cage fight from time to time and has been training local fighters at Elite Performance MMA. As a lifelong martial artist, his goal is to focus his time on changing the lives of the people who walk through the doors of his gym. Internet Marketing however, has only been a second thought. For more than two years I have been training under the tutelage of Coach Horn and fell in love with the vibe in his gym. It was never a place where the strong can pick on the weak or a place where tough guys go to take their frustrations out on each other. As I’ve been splitting my time between Elite Performance MMA and Webaholics, I’ve always believed in Jeremy’s message and have been persistent in trying to increase the gym’s visibility on internet. 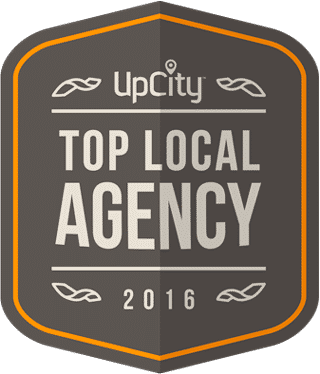 With such a marketable brand, Elite Performance has functioned just fine through word of mouth, but with a properly designed website and solid marketing plan, we could see even better results. New Graphics: Using updated graphics, animations, and content, our Webaholics Team was able to give the brand a more distinct “look and feel”. We wanted to help his users learn more about the gym by using more images of the facility, the members who train there, and candid images of the training itself. Mobile Responsiveness: Like all of our websites, ElitePerformanceGym.com is capable of being displayed on any screen size. Phones, tablets, laptops, and desktops will all be fully functional while scrolling through the content and information on the site. 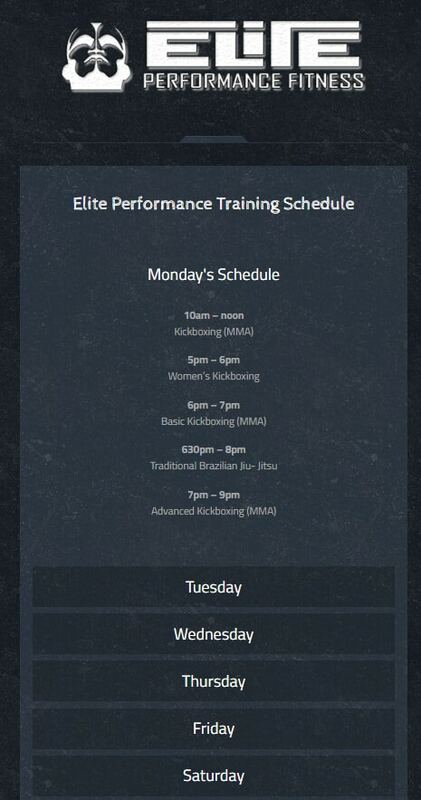 The training schedule is also mobile responsive. Conversion Ready: Jeremy’s website was built with a single purpose: to gather potential leads and interested customers through providing unique and relevant content. In order to facilitate this goal, we created contact forms, FAQ page, and specific pages on the various disciplines that are offered in the gym to provide information in a useful, user-friendly way. 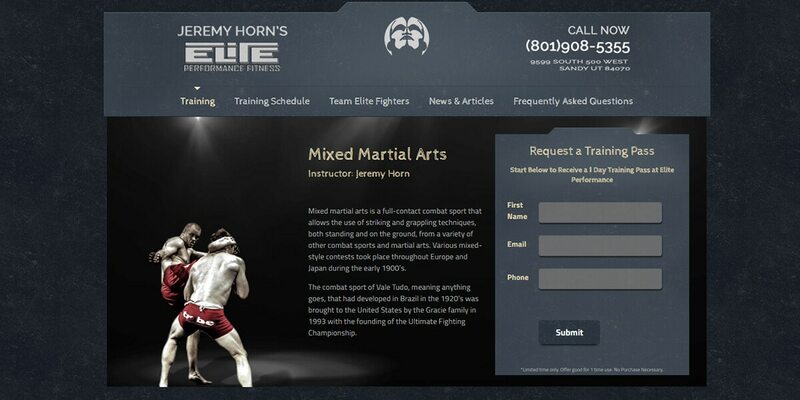 Elite Performance now has a website that represents Jeremy Horn’s message and helps his potential members learn more about Mixed Martial Arts training. With a solid online platform, Jeremy can go back to training the members in gym and Webaholics will handle the rest. If you are interested in our work with Elite Performance and would like to learn more, give us a call at (801) 432-0676 or shoot us an email at info@webaholics.co.